It is quite common for computer users to develop shoulder pain because they have to keep their neck and wrists in one posture for an extended time. Sticking to one posture can cause tension in the muscles and tendons. In most cases, there is nothing to support your shoulder, especially when you are using the mouse. This can cause muscle imbalance and damage that can lead to shoulder pain from computer use. The pain can sometimes be quite severe, especially when your incorrect posture leads to nerve entrapment. Let's find how to diagnose the problem and what to do to fix it. You have shoulder pain in the arm you use to operate your mouse. This is usually the case when you keep your elbow tucked into your wrist with your arm ahead of your shoulder, which leads to sustained tension in the arm, causing the muscles and tendons between your neck and wrist to tire. This puts serious pressure on your shoulder and causes pain. Correcting your posture, using physiotherapy, and opting for a vertical ergonomic mouse may help correct the problem. You have pain in your shoulder but that is not in the same arm you use to handle the mouse. This could be the result of using a shoulder bag often. Wearing a shoulder bag or carrying a workbag often can cause the imbalance in your back and chest muscles, which in turn can cause shoulder pain. Consider using a backpack bag instead. Take a band and hold it with your palms facing upwards. Grip it tightly and raise your arms right in front of you. Your arms should be extended in front of your body, preferably at shoulder height. Now, slowly open your arms out while using your shoulders. Be sure to squeeze your shoulder blades together when stretching the band. Feel the stretch in your shoulders and then slowly return to the starting position. Take a band and hold it tightly with your palms facing downwards. Slowly extend your arms in front of you and slowly raise them above your head. Keep your head up all the time. While keeping your elbows straight, use your shoulder blades to bring your arms down. Ensure that the band touches the nape of your neck. Return to the starting position and do 25 reps to get good results. Stand in an upright position against a wall. Put the massager ball in a sock and drop it over your affected shoulder. Adjust the height by changing the length of the sock. Now, lean against the wall and exert pressure on any area that seems sore. Maintain the pressure until the tenderness goes away. Now, move the ball and find another sore point. Repeat the same. Continue with this massage technique for a few minutes to feel better. Get on to the floor and lie on your side. Keep your arms in front of you and your knees at a 90-degree angle. Ensure that your knees and hips stay fixed throughout the movement. While keeping your hand near the ground, gently use your arm to trace a big circle. It is better to keep your hand on the ground, but you may not be able to do it in the beginning due to tight muscles. Just keep doing the stretch and you will get better at it. Now, slowly let your chest and head to roll open. Look at the ceiling while rotating your arm. Feel the stretch for a few seconds and then return to the starting position. Repeat a few times and then switch side. 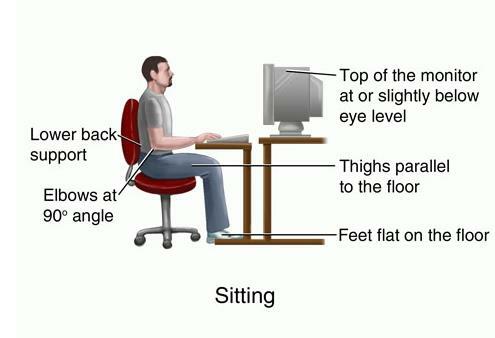 Pay special attention to your posture when using a computer. You need to ensure that you select a chair with adjustable height. It should offer lumbar support. Ensure that your computer screen is at arm's length with top of the screen right in front of your eyes. Ensure that your wrists stay aligned with your hand and forearm. There should be no angle between your wrist and hand, especially when using your mouse. Keep your upper arm in the right position. It is better to keep it by your side with your inner elbow slightly touching your side. Keep your forearm in front of your side. Consider using a pull-along office or laptop bag. It helps reduce the twisting action to protect your shoulder and upper back from getting injured. Do not sit in one position for long. It is better to take short breaks at regular intervals and stretch your muscles and tendons to prevent injury and shoulder pain.